When it comes to running, effective hydration requires a litany of decisions, like whether or not to use sports drinks and whether to follow your thirst versus setting a schedule. While there’s always a temptation to just do what feels right, “if you’re not hydrating well, you won’t be able to push your body as well,” says Stacy Sims, PhD, an environmental exercise physiologist and hydration expert. Douglas Casa, PhD, has authored more than 200 publications related to heat and hydration issues for athletes. The necessity of proper hydration is something he understands from experience: “When I was 16, I suffered an exertional heat stroke during the New York state championships. I was on my final lap, and it was during the summer, and my body gave out.” In order to avoid both extreme situations like this or plain old fatigue, Sims and Casa shared their thoughts on how runners should best hydrate. “Most people assume fluid loss is the same for everyone, but it’s different for each individual,” says Casa. “Everyone has a different sweat rate. The three things to consider are the intensity of your run, the environmental conditions and your body size.” Men and women also require different hydration strategies. “When we run, there are so many things that affect thirst sensation,” says Sims, which is why she doesn’t recommend the drink to thirst philosophy. “It changes across your menstrual cycle, for example.” Her advice? “Sip, sip, sip” water with a dash of salt as you go. While hydration is important, it’s not something you have to worry about if you’re out on a shorter run, anything around an hour or less, and started out hydrated. “Consider the sun and humidity, of course, and maybe back it up to 30 minutes or so, but for the most part you’re good as long as you rehydrate throughout the day,” says Sims. “It’s important that people understand that they can drink too much,” cautions Casa. “If you drink so much that you dilute the sodium in your system, that can be dangerous too.” He also advises against launching a new hydration strategy in a race. Your stomach needs practice, too, when it comes to integrating a new hydration strategy. Want to implement these tips? Casa recommends backpack or water belts, which “are easy ways to carry water with you when you’re out for a run.” If you don’t want to carry water with you, Sims suggests routing your run to pass by water fountains or other water sources. On March 9-10, 2017, Drs. 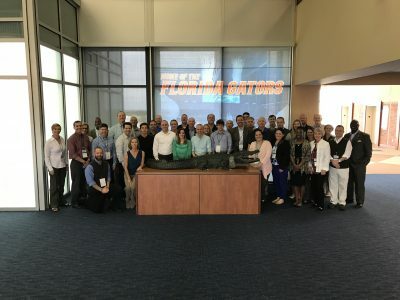 Douglas Casa, PhD, ATC, FACSM, FNATA, FNAK and William Adams, PhD, ATC along with KSI staff member Courteney Benjamin, MS, CSCS traveled to the University of Florida to attend their Collaborative Solutions for Safety in Florida High School Sports meeting. 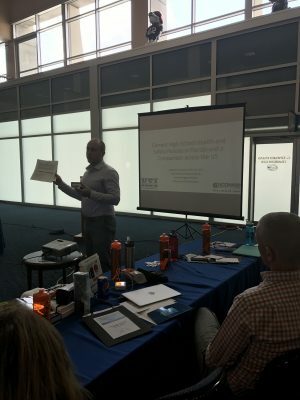 Organized by the University of Florida and the Florida Association of Sports Medicine, the aim of the meeting was to begin the steps of health and safety policies for the Florida’s high school student-athletes. The meeting was attended by representatives from various regions within the state of Florida and included sports medicine physicians, athletic trainers, high school administrators, coaches and the Florida High School Athletics Association. Dr. Casa spoke on the importance of implementing evidence-based best practice policies focused on the leading causes of death in sport and provided numerous case examples as to how these policies have been effective at reducing the number of sport-related deaths. Dr. Adams followed by discussing the current standing of health and safety policies mandated for high school athletics in Florida. Following these initial talks, the rest of the meeting consisted of various break out sessions specifically designed to stimulate discussion amongst the group and discuss strategies for how to implement changes to current policies related to emergency action plans, environmental monitoring and activity modification guidelines, concussion, AEDs and coaching education. Discussing the current barriers for implementing the aforementioned policies and strategies to overcome these barriers with the attendees, who many are the state leaders in their respective professions, allowed everyone in the room to participate to assist in developing a plan going forward to present to the Florida High School Athletics Association to further protect their student-athletes. Overall, this meeting was a tremendous success and we are truly thankful for the University of Florida and FASmed for organizing this meeting and for the University of Florida for hosting the meeting at their facilities. Having a group of highly motivated individuals from across the state of Florida come together to discuss how they can improve high school student-athlete health and safety is a model example of ways other states can have similar successes. The coordinated efforts of sports medicine professionals, high school and state high school athletics association administrators and coaches is instrumental for preventing sudden death in our young athletes who have a full life to live in front of them. INDIANAPOLIS – Emergencies are rarely predictable and that’s why having a detailed plan matters, especially when it comes to the health and safety of young athletes. That was the underlying theme as health care experts released comprehensive emergency medical recommendations for youth sports leagues Tuesday at the 8th annual Youth Sports Safety Summit. The findings of a task force that originally convened in 2015 also were published in the Journal of Athletic Training on Tuesday. The task force was led by the National Athletic Trainers’ Association and the Korey Stringer Institute. The Sports and Fitness Industry Association says nearly 31 million children ages 6 to 14 participated at least once in sports or activities in 2015. Studies show 3.5 million children under 14 are treated annually for sports injuries. The guidelines cover creating emergency action plans for sudden cardiac arrest, catastrophic brain and neck injuries, exertional heat stroke, potentially life threatening medical conditions, environmental issues such as lightning and access to medical services. Beyond creating the plans, the task force called for youth organizations to develop training programs and education members on sports safety practices and create a reporting structure to monitor compliance. There is no one organization that rules all of youth sports; each sport has its own national governing body. The task force got commitments from national governing bodies on what key policies they would implement in terms of the emergency assistance plans and changes to their organizational structure. The national governing bodies would then disseminate the information to regional and local leagues. Huggins pointed out that the document is structured in an easier to use way than many medical studies or journal articles might be. “Every single bit of information in the text is also in checklist form — tear it out, take it with you, write stuff in it and use it,” he said. “And then say, do I have this, do I have this or this? Alexandra Flury from Safe Kids Worldwide noted that education is among the best means to improve safety at the grassroots level. A key point was that parents need to know about safety and policies in place rather than assuming they exist or that coaches and league officials have the proper training. Parents need to ask questions. Wet Bulb Globe Temperature or Heat Index? On February 27th, KSI’s Vice President of Education and Communication, Yuri Hosokawa, PhD, ATC was invited to give a presentation on wet bulb globe temperature (WBGT) based activity modification guidelines at the Athletic Trainers’ Society of New Jersey. In the CAATE Athletic Training Education Competencies [5th Edition] under the Prevention and Health Promotion section, it is stated that athletic trainers should be able to “explain the principles of environmental illness prevention programs to include acclimation and conditioning, fluid and electrolyte replacement requirements, proper practice and competition attire, hydration status, and environmental assessment (e.g., sling psychrometer, wet bulb globe temperatures [WBGT], heat index guidelines).” That being said, we, as Athletic Trainers and clinicians have all been exposed to the utilization of a sling psychrometer, WBGT, and heat index to monitor and assess environmental heat risk. But do you know the differences in how they work? Without the proper understanding of these indices, you may not be capturing the heat strain appropriately. For example, WBGT of 82°F and heat index of 82°F represent very different environmental conditions because of how these numbers are derived. To calculate WBGT, you will need: wet bulb temperature (Tw), globe temperature (Tg), and dry bulb temperature (Td). Wet bulb temperature is a measurement of humidity, globe temperature is a measurement for amount of solar radiation, and dry bulb temperature is a measurement for air temperature. In addition, wet bulb temperature and globe temperature are influenced by wind speed. WBGT equation (see bellow) weighs heavily on the Tw (70%) because the air saturation dictates the capacity for the body heat dissipation through sweat evaporation. Since evaporative heat loss accounts for the majority heat dissipation during exercise, an environment that hinders this process will pose an extreme heat strain. On the other hand, heat index is a number that shows “how hot it feels” when relative humidity is factored into the air temperature. It also assumes that the environment is under shade (i.e., not full sunshine) and that the person is walking at 3-mph, which is does not depict the heat stress of someone performing intense exercise in the heat. Therefore, it is apparent that activity modification guidelines that rely on heat index is not appropriate in an athletics context. Lastly, the measurement taken from the sling psychrometer is reflective of the Tw and Td. Typically, a sling psychrometer unit comes with a conversion scale, which allows the clinicians to use the Tw and Td values to calculate the heat index. Athletic trainers, who are interested in checking or improving current activity modification guidelines, are encouraged to review Table 5 from the NATA Position Statement on Exertional Heat illness, which shows an example from the Georgia High School Athletics Association’s activity modification policy using WBGT.